So you want to carry your toddler? Keep reading for the best carriers for toddlers and older kids! As your baby becomes a toddler, you’ll want to find a carrier that is supportive enough to carry their weight and be comfortable for you both. Well, look no further: we’ve rounded up our favorites here! Define “toddler carriers” and give you information about how to know when your child is ready for a toddler carrier. Know what you need already? Use the links below to skip to the section you want! Alternatives if the standard carriers don't work for you! What is a Toddler Carrier and do you need one? 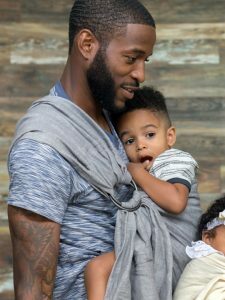 Over the last several years, many of our favorite babywearing brands have introduced “toddler” carriers. Most carriers with this name are buckle carriers that are bigger and taller than the Standard sized carriers, so they are able to carry bigger heavier children. The name can be a bit confusing, however, because most of these carriers have a minimum age guideline of baby being at least 18 months and a sizing guideline of wearing 2T pants. Some children are big enough for “toddler” carriers when they actually start toddling, while others are much older (2 or 2.5 years is common and more petite children may need to be 3 or older) to fit. The distinction is important because the best Toddler Carriers might also be called Big Kid carriers! It’s best NOT to “size up” or get a toddler carrier early for baby to grow into. A carrier that is too big will not be supportive for your child and therefore may be uncomfortable for both child and the wearer. 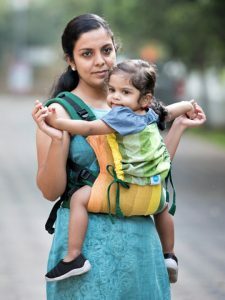 For more on Toddler Carrier sizing and whether your family is ready for one, read our article Do You need a Toddler Carrier? The type of carriers you pick should be based what activities you will be using the carriers for and exactly how big your toddler is. 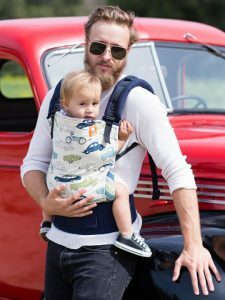 If you are looking for a carrier for quick carries (such as trips to the store, errands, short walks in to drop off your older child at school, you’ll want a fast and easy carrier that is fuss-free. We love a ring sling for this! 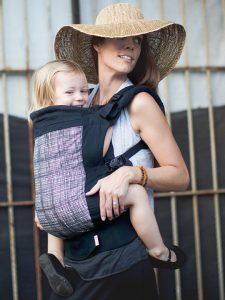 For our recommendations, skip continue reading for our recommendations on best carriers for toddlers when you are doing a quick carry. 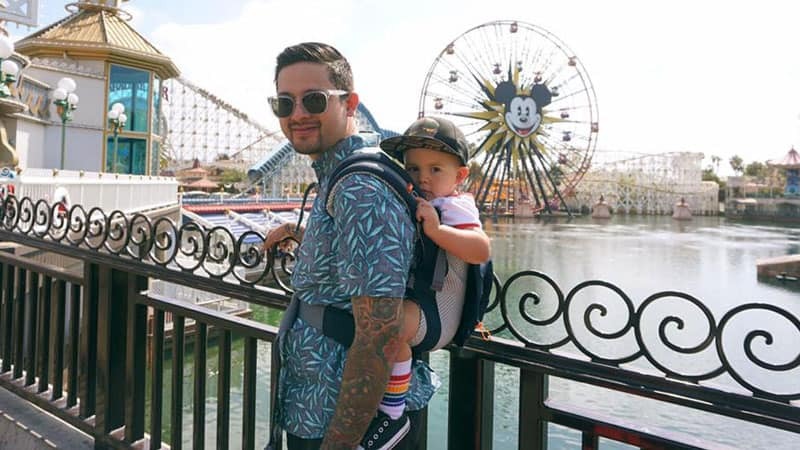 If you need a two-shouldered carrier or know you want a hiking carrier or to be able to use the carrier for long walks and day trips (hello, Disney or other theme park), skip down to our Best Carriers for Toddlers – longer carriers and hiking section. 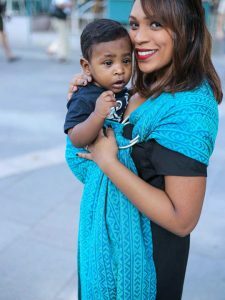 When you want something fast and easy and you’ll be wearing your toddler for less than an hour, we recommend a ring sling.Why? 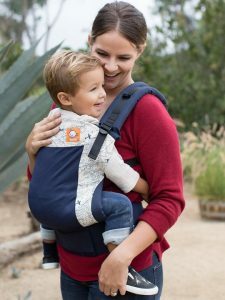 Ring Slings are super quick to put on – perfect for kids that want to get up and down a lot (which is pretty much most toddlers). 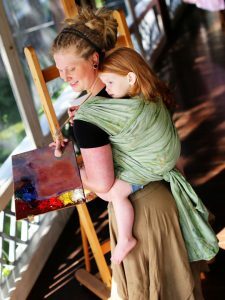 Ring Slings are super snuggly and mimic your natural position of holding your toddler on your hip. Ring slings are compact and can be easily stowed away in the diaper bag when not needed. Jacquard-woven cotton ring slings are cushy and supportive enough for a toddler ring sling - although they are easy to use with younger babies as well! The woven fabrics molds to your body, giving you the perfect fit every time - especially important for supporting additional toddler weight. 50-50 cotton/linen blend offers great support in a beautiful herringbone weave. Great ergonomic support for both baby and parent. A good buckle carrier can make your heavy toddler feel almost weightless! Can be worn on the front or the back. 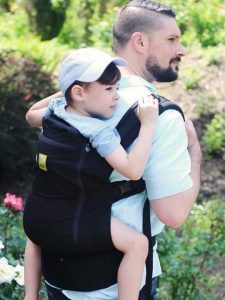 Back carries are most comfortable as your child gets bigger. For a smaller toddler (not yet wearing 2T pants and under 32″), choose any of our standard buckle carriers. The Tula has a bigger and taller base than some other carriers means your small toddler won't grow out of the carrier too fast. Comfortably fits wearers of different sizes, from petite to plus-sized. Wide base and tall back to support your small toddler, plus optional footstraps to support their legs in the proper position as they grow. This is ideal for kids who may be between carriers- getting big for Standard sizes but not yet ready for the bigger Toddler sizes. Soul's Full Buckle carriers have a generously sized panel, are lighter weight and a bit less bulky. For a big kid at least 18 months old AND over 25 lbs and 32″, we love buckle carriers that are designed for older kids. Please note that if your child does not meet all of the size requirements, it is best NOT to size up. The Standard carriers are often perfect for kids as old as 2.5-3 years. Different fit from the Tula - a taller body and darted seat are deeper than the Tula's to offer great support, making it ideal for big kids. Can can cross straps in back if wearing on the front. Perfect fit Adjusters help get a great fit and make nursing easier. Has a cool mesh version, the Beco Cool, which is great for summer. 17'' wide at base, 19.5'' tall from top of waistband to top of curved panel. The Lillebaby Carry On is a simple toddler carrier currently available in Airflow (with mesh panel). Straps can cross on your back and there is a lumbar support panel for front wearing. Panel is 16'' wide and 19 '' tall Has a waistband pocket plus additional pocket on the pane of the carrier. Looking for something different? Try a meh dai (mei tai) or a woven wrap with toddlers. comfortable for wearing with older toddlers, and many people find them easy to use. have a very natural feel on the body and are less bulky than buckle carriers. less intimidating than wraps for new babywearers. very comfortable and can be worn in varied ways so as to reduce your risk of fatigue, soreness or injury. recommended as toddler carriers for babywearers who have wrapped previously or love the idea of trying to get into wrapping. The only carriers that we don’t recommend purchasing for a toddler or older child are stretchy wraps. The stretch does not make them as supportive due to the weight of the child. While it is possible to use the Wrapsody Stretch Hybrid for heavier children, woven wraps are a better choice if you are buying at this age. 1. Children don’t always walk as quickly as you might want, or in the direction you want! Pop her in a toddler carrier, and you can get where you need to, when you need to. 2. Children are not always cooperative, especially when you are in a hurry. Load him into a comfy child carrier and he is likely to settle down, or, at the very least, he can’t wreak any more havoc! 3. Children get sick, tired and cranky, too! They still need and want cuddling, and not always at the most convenient of times. A great carrier can be a lifesaver!